Medical Solutions, a pet friendly travel nurse staffing company, is celebrating Nurse Week 2013 with a bundle of contests, giveaways, and other festivities. As one of the nation’s top travel nursing companies, it is a priority for us to use this week as a way to honor and recognize the dedicated nurses who provide fantastic patient care year-round. 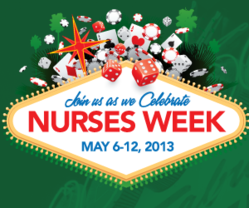 •Two nurses each day, May 6-10, will win Vegas-themed Facebook contests such as the RN Roulette Sweepstakes, “Let’s See Your Poker Face” Photo Contest, Hunka Hunka Caption Contest, “Viva Las Vegas” Trivia Game and the “Winner Winner Chicken Dinner” Instant Win Game. Assorted prizes include iPad Minis, 3-piece luggage sets, and $250 gift cards for gas, spa services, and airfare. •Nurses Week cards will go out to all Medical Solutions Travelers featuring special scratch-off tickets with two opportunities to win. Participants will enter their scratch-off codes at WeLoveOurNurses.com. One lucky scratch-off winner will receive a trip for two to fabulous Las Vegas, Nevada, October 28-29, 2013, for the 2013 Travelers Conference, with airfare, lodging and spending cash included. •Nurses of Tomorrow, Medical Solutions’ second annual scholarship competition, in honor of Nurses Week, and in an effort to help educate future nurses and nurse leaders, ultimately easing the nursing shortage. Applicants will be judged on several criteria, including a 250-word essay answering the question: “What do you feel are the most important components needed for quality nursing care?” Three lucky, undergraduate winners will receive $1000 scholarships. Applications are due by June 6, 2013. Click here for full details and to apply. Visit WeLoveOurNurses.com for more details on all of Medical Solutions’ Nurses Week celebrations and giveaways. ABOUT MEDICAL SOLUTIONS: Medical Solutions L.L.C. became the nation’s third-largest travel nurse staffing company with its acquisition of OA Nurse Travel in February 2013. Medical Solutions was one of the first Travel Nursing and Allied Healthcare staffing companies to be certified by the Joint Commission and has been continuously certified since 2004. Its focus is on meeting the urgent and short-term staffing needs of its clients with highly skilled Allied Health professionals, nurses and technologists. Medical Solutions was named one of the top three staffing firms to work for in Staffing Industry Analysts’ 2012 “Best Staffing Firms to Work For,” and was also named to the 2012 Inc. 5000 list of fastest-growing private companies. A nationwide network of travelers allows Medical Solutions to help its client hospitals continue to provide excellent patient care amidst a Nursing and Allied Health shortage. Medical Solutions has contracts with nearly 1,200 client hospitals nationwide and is one of the fastest-growing companies in the Travel Nursing and Allied Health industry. Visit MedicalSolutions.com to learn more.